The Low Down: Scarlet’s grandmother is missing, and no one seems to care except her. Sure, she’s eccentric and prefers to stay on her farm instead of mixing with the locals, but that doesn’t mean she’s crazy. Scarlet knows that Grand-mère would never just walk away of her own accord. While making her deliveries for the farm, she meets a street fighter named Wolf. A soft-spoken man, he surprises Scarlet when he asks her for work. She declines, after which he tells her where to find him if she changes her mind. Then Scarlet’s estranged father shows up at the farm, tearing apart Grand-mère’s room, looking for something. He’s been held captive and tortured, his keepers demanding that he find something they need. But when he tells Scarlet that the only thing he remembers about his captors is an unusual tattoo, with a sickening feeling, she realizes that it is the same tattoo that she saw on Wolf. Meanwhile, Cinder escapes prison, gaining a partner along the way. “Captain” Thorne is a cocky, swaggering smartass. But he’s the best kind of cocky swaggering smartass; he’s the kind that has a spaceship. Making their way to the warehouse where the ship is housed, they take off, buying some precious time to come up with a plan to find a woman named Michelle Benoit. Now that Cinder knows her true identity and what Queen Levana’s evil plans are, she must do whatever she can to save the Earth, save Kai, from war. But when you are a fugitive with mind-controlling Lunars searching for you, peace is a hard thing to find. And as for Scarlet? Against her better judgment, she may have to trust something that seems the most deceitful and cunning. A Wolf. Best Thang ‘Bout It: If you are one of those readers who worries that the second book in a series won’t be as good as the first, I will help you here. No, this book isn’t as good as the first. It’s better. I was sort of putting off reading it, but since it’s from the library and there’s a line of (approximately) one gazillion people who have reserved it after me, I knew it was either now or next year. WOW. This book is absolutely fabulous. I wanted to read straight through it and never set it down, except for the fact that some people need to be picked up from school and some people need to eat dinner. Selfish, ikr? The new characters, the more-than-just-a-nod to the original tale of Little Red Riding Hood, the change in setting, the alternating between Cinder’s story and Scarlet’s story all are solid, exciting, perfect. The fact that this tale is just as much (or more) about Scarlet is genius. Everything ties together well between the characters, and there is a lot of mystery that gets your blood pumping and your brain whirring. I don’t usually talk about covers, but the artist/graphic designer/whomever who puts together Ms. Meyer’s covers needs a huge bonus. The iconic picture on Cinder was jaw-dropping enough; the fact that the second cover is just as memorable, ties in the original fairy story, and pairs so nicely with the first cover, shows an amazing talent. Kudos. The Bottom Line: If you liked Cinder, you will be bowled over by Scarlet. Just find someone else to run your errands and get pizza delivered that day. You’re welcome. 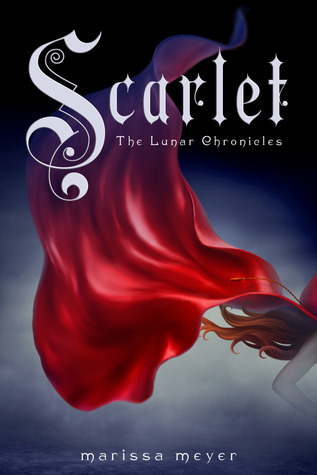 Scarlet by Marissa Meyer was published February 5, 2013 by Feiwel and Friends. Ink and Page picked this book up from the library, so no one had a choice about whether it was reviewed. YAY! I’m so glad you loved Scarlet. I couldn’t believe how good it was, and how much I am enjoying the Lunar Chronicles. I guess we have to wait until 2014 for the next installment…Cress, which is about Rapunzel! Woot. Love your review and yes, I loved it more than Cinder..I am dying for book three! Yay! I never was a huge reader of Science Fiction-y type stuff, so when I got the first one, I’ll admit it was due to the cover. It still took me a long time before I read it, though. I did really enjoy it, but, yes, I liked this one even better. Cress! Cress! Cress! I can not wait until my copy of Scarlet gets here! I’m so ready to be lost in Marissa world again. Great review and I’m glad you enjoyed it! Let me know what you think after you read it! I am getting my copy of Clockwork Princess today, and I am reeeeeaaaally looking forward to that.